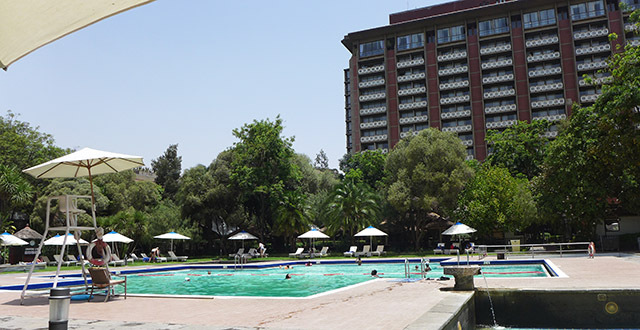 The weather in Addis is mostly wonderful and hiding away at a swimming pool on a hot day is the perfect escape from the hustle bustle of the city. 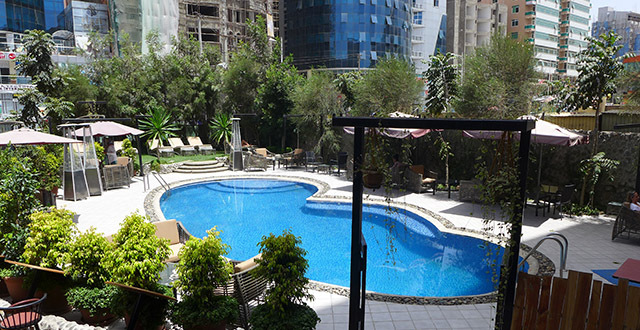 Fortunately, there are plenty of swimming pools in Addis to choose from. 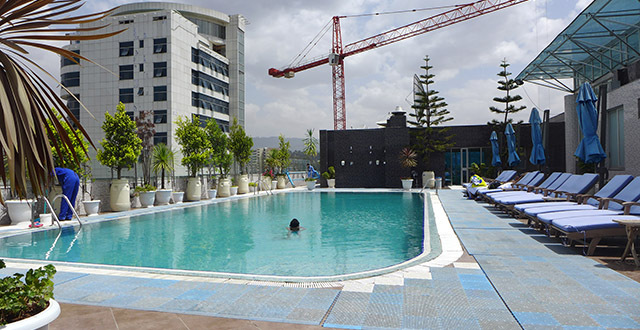 What follows is a list of the swimming pools in Addis Ababa I’ve found so far with a bit of a summary or what to expect and a list of prices. Keep in mind that the prices were accurate in October 2015 so if you’re reading this far into the future (hello from the past!) then it’s probably better just to use the prices as a means of comparing the cheaper ones versus the more expensive ones. If you do have any updates for me or know of a pool for me to check out to add to the list, please email me at kirsty@livinginaddis.com. Capital Hotel has a range of passes and prices so your best bet is to go in and see them. If you want to get a membership for off-peak times (which I assume is during the day) then things will get a bit cheaper. The a day pass it’s the most expensive pool in town which seems a bit strange to me since there are other much nicer pools. Sure, the pool is fine and an ok size to be able to swim laps, but it’s certainly not secluded and there’s little space around it to chill. It feels sort of closed in an, while it’s a nice enough pool, I’d spend my money at the Sheraton or Intercontinental instead. Addis Ababa’s Hilton has a bit of a communist bunker sort of feel to it… probably not the best look for a supposedly high-end hotel chain. It’s certainly seen better days and the swimming pool is no different. The changing rooms are cramped and kind of gross. Plus the communal shower isn’t something I’d expect when I’m paying 300 Birr to use the facilities. For that price I’d at least expect some nakedness privacy. The way the pool is set up doesn’t leave a lot of room for doing laps if there are more than a couple of people in there. One side is for the kiddies and the other is the deep end where people attempt to do laps. The weird cross shape and the fact that it’s been divided in half means that there’s not much space and the five or some people doing laps at the same time as me kept nearly colliding. I did two and fled. The water is hot spring fed (or so I’m told) and so slightly warm. This is great for some but it’s not the most refreshing splash around after a day of sun baking. It would be a pretty good choice for colder days where you still want to try to get some laps in. If the human traffic allows it, of course. A rooftop pool! With a bar! This spot is so cool and I was amazed to see that on a hot Saturday afternoon only two young kids seemed to have discovered it. If it’s not to busy you could get away with some short laps in here but since the stairs take up a huge corner of the pool, there probably couldn’t be more than a couple of you attempting laps at once. But really, rooftop pools are for sipping cocktails, sunning yourself, and going in for the occasional dip, anyway. 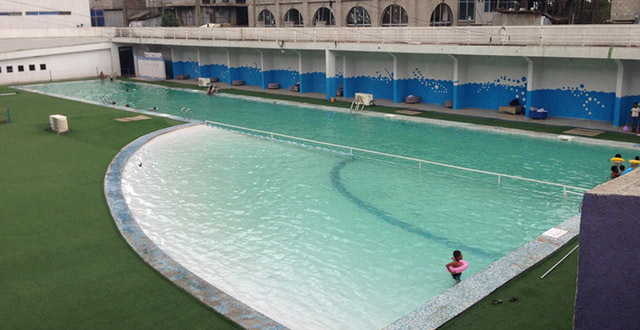 As far as swimming pools in Addis Ababa go, this is one of my favourites. A friend told me that the pool at Monarch was free if you bought food or a drink. This turned out to be a bold-faced lie! Or perhaps just a mistake. Probably just a mistake but sometimes I like to be dramatic. This little pool is more for lounging around that for exercising but it’s still a decent enough size to give you some splash space. There are lounge chairs around and tables, too, if you’d like to swim and eat. The pool is a bit on display to everyone coming in and out of the hotel but is somewhat secluded from the restaurant/bar. But I kind of like that it’s in front of the hotel surrounded by tall buildings. It feels like a little oasis in the middle of the city. Now THIS is a pool! Sure, the price is high for a day pass but it’s not bad at all when you compare it with the cost of other pools. Especially the Hilton. That these two pools are the same price is a travesty! Well perhaps that’s a bit extreme but seriously, Hilton… how do you get away with charging the same as the Sheraton’s glorious, spacious, secluded pool? Shame on you, Hilton! The pool was quiet when I was there but given that the Sheraton is a fortress of a place, and there there seem to be hundreds of deck chairs laid around, I imagine it can get pretty busy. There’s a cafe and a bar right next to the pool so you’re pretty much set to camp out all day if you desire. This is the weirdest pool I’ve ever seen. But, when you think about it, also totally practical. A super long bit for those serious lane swimmers among us, and a little sectoin over on the edge for kids to splash around in. I’m not sure if the laps part is 50 metres but I wouldn’t be surprised if it was. The pool is quite big. Located in Laphto Mall, this pool feels a bit concrete-y and closed-in, but it seems like a nice compromise of a pool that’s sort of indoors and sort of outdoors. 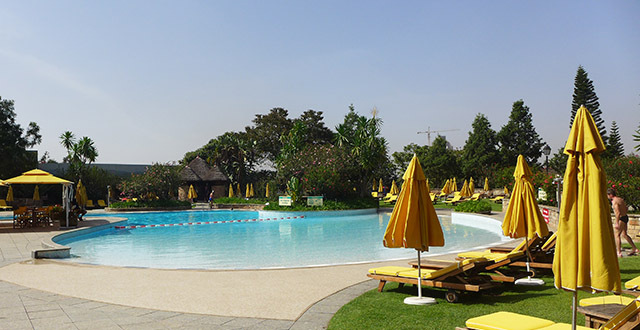 The pool is part of the Vigor Fitness Centre and you can get gym/pool combo deals. 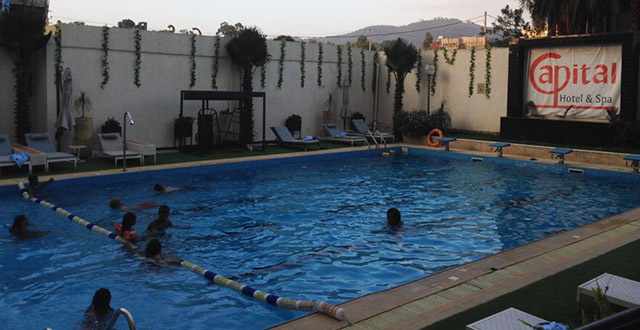 Great that you are sharing such recreational areas for hanging out for swimming. Please keep on sharing recreational places. Such a great analysis it helped me to pick z right one for me. Kristy, is the cost per person? I will be taking my two boys with me. Sorry, I meant Kirsty. Sorry to spell your name wrong!